The UKCampsite.co.uk was asked to take a look at the Spider Catcher - The Unique Solution to your Creepy Crawly Problems! 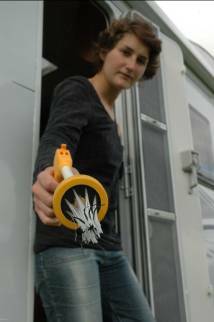 Have you ever wanted a way of removing those pesky little beasts from your caravan, tent and other awkward areas? Well now you can without harming them and keeping you at a safe distance! The Spider Catcher is an innovative new product which uses two sets of bristles to gently catch the spider, carefully trapping it until you release it outside. With a trigger at one end and bristles at the other, there is no need for you to spend your nights on the curled up in the corner of your tent because a spider has decided to move in with you! At only 40 cms in length the travel Spider Catcher is ideal for caravans, boats, motor homes, cars and tents etc. The travel Spider Catcher also come with a special wall clamp so it can be secured attached to a wall ready for use when required. So how does the Spider Catcher work? To release the spider squeeze the lever so the bristles reopen. The Spider Catcher can pick up ants and spiders up to 25mm in body length so this more than covers the average population of spiders in Europe. Due to the unique way in which the spiders are picked up it ensures that, if done correctly, the spider remains unharmed. This is due to the spiders natural defence mechanism, they curl up and avoid damage. Due to the diversity of the Spider Catcher the applications are endless. The Spider Catcher will actually pick up a strand of hair from a table! As well as Spiders the manufacturers tell us that they have caught wasps, bees, moths, butterflies, beetles and even scorpions. The Spider Catcher arrived within a few working days from receipt of order and came packaged well to avoid any damage to the product. The travel Spider Catcher is a very small, lightweight, and seemed a durable piece of kit. It is around 41cms long so doesn't take up too much storage space when packing up the car or storing in the caravan. 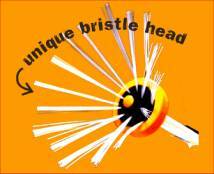 The Spider Catcher comes complete with a protective cup to keep the bristles from getting damaged, mishaped etc. which simply pops off and is ready for action. The Spider Catcher works on a spring loaded mechanism, you simply pull the handle together, the bristles at the other end open up, scoop up the spider and release your grip on the handle. The bristles gently close around the spider causing it no damage and you can safely and confidently place the spider in the location of your choice. If you have had enough of the glass and the paper trick to get rid of spiders then this really could be the answer you are looking for, it is small, lightweight, easy to use and a great companion for those who really don't like spiders!